Last summer flowers are just holding on as Autumn takes hold. I was well chuffed that this year saw my first success growing sweet peas from seed! Although this wasn’t the colour on the packet it has looked great mixed with white borage which is also still in flower. Deep purples flowers look particularly good in Autumn don’t you think? This clematis, Fleuri, was a new one to my garden this year that only grows to approx 1 metre (3 - 4ft) - so great for seeing the flowers then? Well, perhaps not if you don’t remove the dead ones! I was a bit lax on this and didn’t see as many flowers this year – note to self for next year. 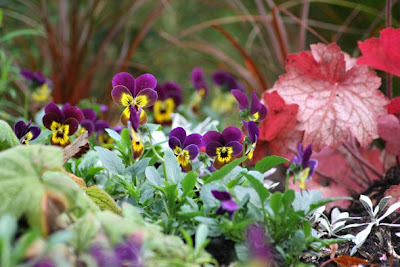 Considering some winter colour this year I bought some viola plug plants that I brought on in my small greenhouse. They are now quite happy out in a border and I look forward to seeing this smiling Babyface Ruby & Gold all winter. Autumn is a season for more than just the last pretty flowers don’t you think? 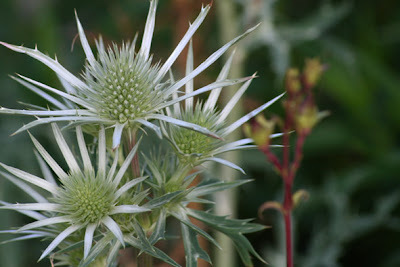 Grasses and more unusual flowers like the spiky flowers of the Sea holly and the spires of the Gunnera flowers begin to steal the show. 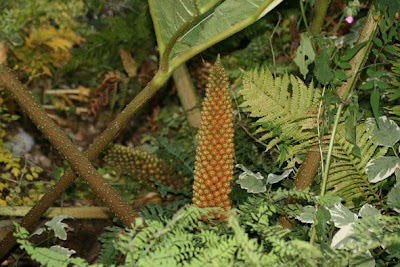 If you are worried about how to protect your Gunnera for winter you can see what I do here. Gosh I'm almost a week away from this! I'll keep an eye on the weather now but it doesn't feel quite cold enough to tuck it up for winter yet. Fungi too I have noticed more at this time of year when on walks. I have taken some photos recently but gosh the plain duller ones are not half tricky to ID even with photographic reference books! There are so many. 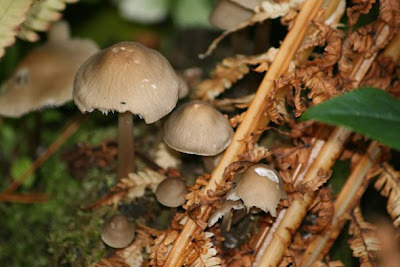 I would suggest that you photograph the stem too as that will help an ID greatly. Walking away from the border after taking my Gunnera pic above I spotted these growing on a mossy log. It looks like something has been eating them! If anyone would like to help me out with an ID on this one (common one I expect) and to what has been eating it that would be great. 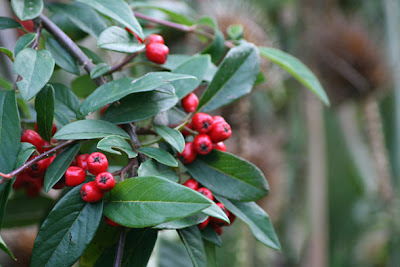 Berries are also adding colour to the garden at this time too although I don’t expect these cotoneaster ones shown below will be there in a week or so – the blackbirds are starting to eat a few! That I am more than happy about – I planted this tree near the bird feeders especially for them! Brown teasel seed heads can be seen just behind the berries. I must cut a few heads and put them in a paper bag to collect this seed for next year. However this too was planted for the birds – the goldfinches. I am really looking forward to seeing if they will feed on them after reading that they should do. That will be fascinating to see. Very surprising to see is the flowers that are trying to flower out of season! I say ‘trying to’ as I wonder if a frost will quite literally nip them in the bud. 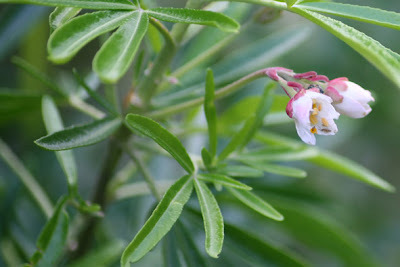 Seen below is one of the many blossom racemes of a Pieris (I have two plants like this) and the Choisya Aztec Pearl with a few wonderfully scented flowers about to open. Even more strange is that this Choisya is less hardy than the Ternata variety I have. Japanese Anemones have always been a great source of flowers at this time of year but they have flowered earlier than usual. I am wondering if they may even be missing in my next GBBD line up. Ah… but don't go yet as I’ve a few more yet to show you for this month. No narration on this GBBD video due to technical hiccups and a rather buggy software program – I did try and try. However, I do have an unexpected entry for you. I have also chosen to film in the morning and in again in the evening as it was getting dark as that is when I feel the true depth of Autumn colour can be seen. I find it so atmospheric then – but maybe that’s just me? Did you spot it? This hedgehog kept me from getting this posting sorted last night as I found myself watching the night camera (after midnight) for it to appear again! I built the pile of a few logs, twigs and leaves below the feeder after seeing this at a nature reserve – robins etc would search around it for food. It was fun to watch this hedgehog searching there where it was quite safe – however bonfires are indeed another matter! Enough said I think. Finally, there are still a few more flowers in my garden that got lost on the cutting room floor - Blue borage, Thyme, Red Campion, Heuchera, Stachys – yep I think that could be it now! If you would like to see more current flowers from gardens all around the world pop over to May Dreams Gardens where Carol and many others will be posting on the 15th. I do enjoy joining in with these monthly postings and it's a great way to compare the garden from year to year too. Enjoy your garden flowers! Perhaps I should say that I have posted a day early this month (instead of a few days late) as I will be posting for Blog Action Day on the 15th. This is the second year of this annual event. The organisers hope that 'thousands of bloggers will unite to discuss a single issue'. This year the topic is Poverty. Bloggers are being asked 'to try to keep their posting related to their regular blog topic so that posts are individual, suited to their audience and look at the issue in many different lights'. I better get my thinking hat on now! The video and photos above were taken on October 13th 2008. Oh Shirl, your bloom day posts are so entertaining. I love the flowers and all, your garden is one of my most favorite of all, but the little hedgehog was captivating. I had never seen one and don't blame you a bit for keeping checking for him. What a charming fellow. Thank you for all the effort you put into these posts, and all of your posts. They are wonderful. Wonderful post and video - your garden is looking good - and full of wonderful Autumn colour. I had such a good time visiting your garden, looking at your flowers and watching your video!. The flowers are all lovely...but the hedgehog video was the best. I have only seen photos of the delightful guy. I can't wait to show this video to my good friend who is an ex-pat Brit living in my neighborhood. She loves Hedgehogs! Thanks for a wonderful visit! I always enjoy my strolls through your garden, and your video was lovely, as always. You've still got lots of color! Your garden is looking lovely and the hedgehog is a little star. Great to see an animal we all know about but rarely (if ever) see. I hadn't realised Gunnera would grow away from wet areas - interesting (though I know I haven't got room for one. I'll try to remember that!). Hi Shirl, My goodness you have so many beautiful flowers for this time of year. Your entire garden looks delightful. It must be since you have those sweet hedgehogs and such a diverse group of birds frequenting your garden. I am impressed by that tall hedge shown in one of the photos. Love the video too. Autumn is a wonderful month for flowers, the colours on the trees and shrubs are to die for! 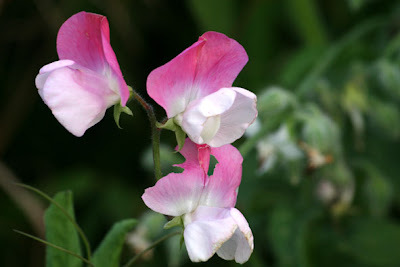 Our sweet peas are still flowering too, my vase hasn't been empty since May/June they've been fantastic and I will dearly miss the scent, something to look forward to at least. I loved the video -- and the hedgehog is adorable! I'm sure you don't think that -- does he eat your plants? Glad you posted some stills, as I have to miss out on video. 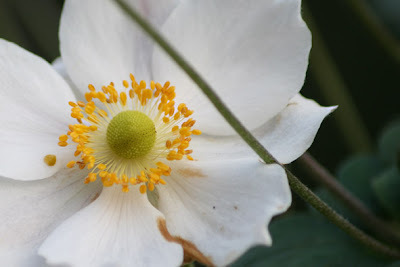 I miss the Japanese Anemones too: they galoped by this year. This huge blogger gathering sounds intrigueing. Thanks for the link. Are you sure you posted the right link on my bloomday site just now? It goes back to this page and I can't see red leaves. In the video maybe? I've enjoyed your post today very much! That video is great and your pictures are fantastic too! I can tell that you've got a beautiful garden! Joco – Sorry you missed out on the video. Sometimes I do photo montages for GBBD, other times just video but this one was especially for people like you who couldn’t view the video. Yes, you are correct the leaf colour was in the video – sorry. 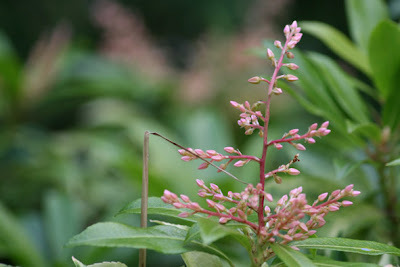 GBBD is a huge gathering and I am sure you will see lots of leaf colour in many other blogs – I certainly enjoyed yours. Hi Shirl and Happy GBBD! It was lovely walking through your garden and inhaling the wonderful autumn scents and looking at all that autumn colour. There is such a lot of it, simply wonderful. Loved the vid, and you've done very well with your sweet peas! That's my Shirl! ;-) The music you choose for the hedgehog made me grin. How lovely to see sweet peas in October, Shirl, and super-wow to the gunnera! That's something I've always wished I could grow. Your slide shows are such a treat, too: Seeing the plants moving adds life to the images and makes them more real. And the hedgehog - too cute! I'm glad I clicked the "more" button to see him eating, and to see the bird trying to get into the feeding box. Your choices of music are so funny. Thanks! Beautiful. Your choice of pictures and the flowers are truely a work of art. Ahh ...it's wonderful to meet a Nature lover on Bloom day! I too am a nature girl and gardener from Canada! Lovely photos, lovely post. I particularly like the cheerful faces of the Violas. 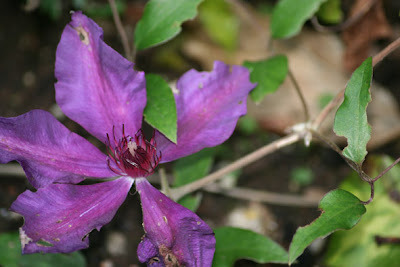 I love the look of the purple flowers against the purple posting of your blog. You have so much blooming. Shirl, as always it's a delight to visit and see what you're up to. I'm no mycologist so I wouldn't begin to hazard a guess on what fungus that is, but it could well be dined on by slugs or snails. That reminds me that I haven't been out in the woods to look at fungus this fall, and I'd best do it before they're all gone. I really enjoyed the video as it captured movement in the garden, too. That's difficult to do with just pictures. And the hedgehog was a nice added surprise! Again a very interesting post, Shirl! And in your little film, showing your beautiful garden, I also discovered "my Scottish black grass" which, by the way does quite well here. I'm wondering how cold it can be in winter in your garden, because I was told that Gunneras are not winterhardy. I saw this huge plant for the first time in Ireland and felt in love immediately. But up to now I didn't have the courage to plant it here in my/our garden, as winter can have temperatures up to - 18°C or even more. Well, a gardener cannot have all the plants he/she wants...I know, but sometimes it is quite hard to accept this ;-) !! Have a nice week with a lot of sunshine!